Slotted: (1) 3/16 in. x 4 in., (1) 1/4 in. x 4 in. and (1) 9/32 in. x 6 in. Phillips: (1) 1-point x 3 in. (1) 2-point x 4 in. and (1) 3-point x 6 in. Square: (1) #1 x 3 in., (1) #2 x 4 in. 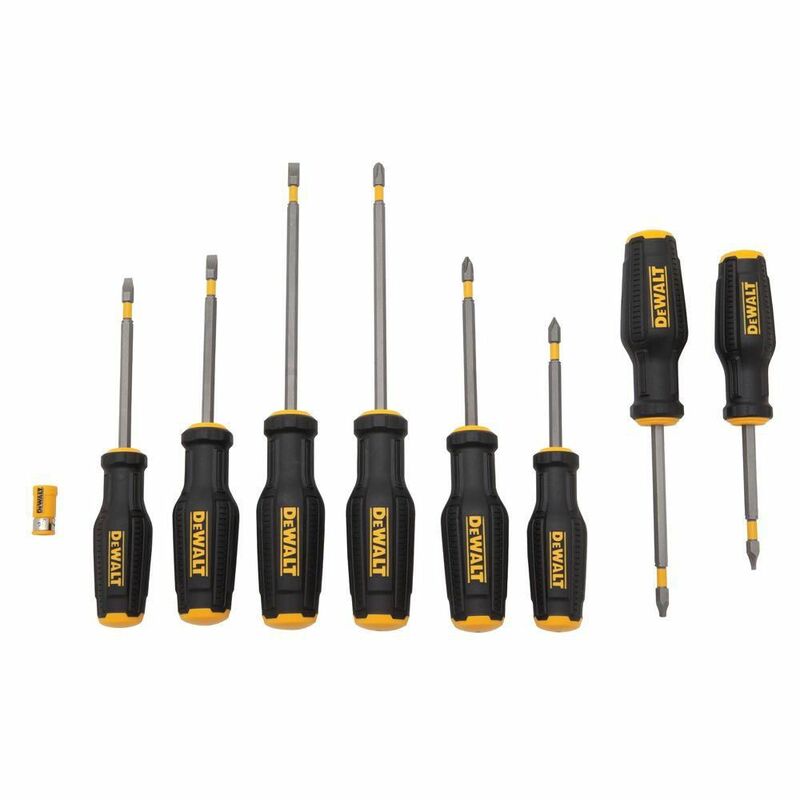 8 Piece Max Fit Screwdriver Set The DEWALT DWHT62058 8 Piece MAXFIT Screwdriver Set is made with a Bi-Material Ergonomic Quad-Lobe Handle Design for comfort and maximum tip torque. The Max Fit Tip design allows for maximum fit in fasteners and eliminates screw stripping. The CNC Machined Tips ensure consistency for fitment and extended life. The tool-grade S2 steel bar and tips allow for high strength and durability. The Magnetic Screw Lock System prevents fastener and screw wobble. The yellow torsion zone flexes reduces cam-out and the hex bar allows additional leverage when used with a wrench. 8 Piece Max Fit Screwdriver Set is rated 4.7 out of 5 by 24. Rated 5 out of 5 by Matt from I have a set and bought more for each of... I have a set and bought more for each of my crew. They work great. Rated 5 out of 5 by Justice1 from I saw this on sake in my Home Depot store,... I saw this on sake in my Home Depot store, took one look and said, " I have to have this. " Anyone that has tools needs this screw driver with multiple tips, both flat and Phillips head. You're done rounding off Phillip head screws. You're done having your screw driver sliding off of flat head screws.Just imagine a screwdriver that acts like a ratchet. This screwdriver cuts your work time down with anything that involves a screwdriver. I had to get into my gas fireplace, and it was nothing but screws. When I was done, I could only say one thing....." Baby, where have you been all of my life? "I guarantee you'll fall in love with this screwdriver, and you'll never have to buy it an engagement ring. Rated 5 out of 5 by Lony2 from I haven't used each of these yet, but I know I will eventually. And from my past experiences, I h... I haven't used each of these yet, but I know I will eventually. And from my past experiences, I have always been able to count on DeWalt. Rated 5 out of 5 by Moe from High Quality Screwdriver!... High Quality Screwdriver!